What, you thought you had the whole Formula One grid figured out for 2016? Bottas to Ferrari, Räikkönen to artisanal cheesemaking, Hülkenberg to Williams, Cow to Pasture, etc., etc.? Ha! Think again, mi amigo. No rumor is sacred now, as Scuderia Ferrari is keeping the Kimster. 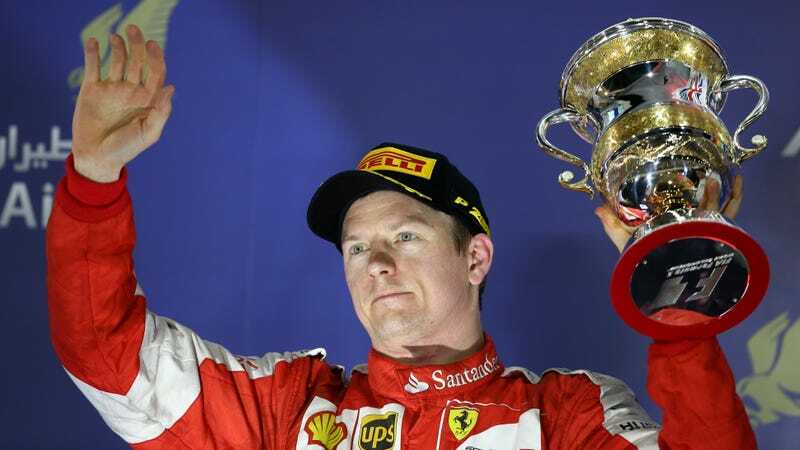 BBC Sport reports that Ferrari renewed their technical and racing agreement with 2007 F1 World Driver’s Champion Kimi Räikkönen on Wednesday. Ferrari, of course, is also keeping Sebastian Vettel in their other car. There was never any doubt about that, as Vettel is third in points behind the two unstoppable Mercedes cars. While Vettel’s been fairly consistent all season long, Räikkönen has struggled a bit this year after playing second fiddle to Fernando Alonso in 2014, hence the rumors of his retirement. Räikkönen has yet to win ever since returning to Ferrari last year, while teammate Sebastian Vettel has had two wins this year alone. We believe that extending Kimi’s contract into the next season will provide further stability to the team. This has been our guideline, also considering the very good relationship between Kimi and Seb. On our side, this shows our great confidence in him, and I expect this confidence to be well rewarded. Sky Sports also points out that Ferrari tends towards a more stable driver line-up than most teams. Only six drivers have driven for the Scuderia in the past fifteen years. According to BBC Sport, Bottas is under option with Williams for 2016, and Daniel Ricciardo just signed a four-year contract with Red Bull last winter. Picking up either one would have involved a costly severance deal with the driver’s current team. As you know, Formula One’s silly season—that bizarre part of the year where everyone speculates on driver lineups for the next year—is in full swing. We’ll have to come up with crazier, farther fetched rumors as a result of this. Get on that, F1 fans. I expect nothing short of a rumored Susie Wolff WRC drive out of y’all.